After ignoring repeated questions all day about whether he would say anything about his political nemesis, John McCain, President Donald Trump finally spoke about him Monday evening, saying "our hearts and prayers are going to the family of Senator John McCain ... and we very much appreciate everything Sen. McCain has done for our country." The president was speaking to a dinner with evangelical leaders. He extended prayers and condolences to the victims of the Jacksonville, Florida shooting as well. The president's comments came a few hours after the White House abruptly returned its flag to half-staff Monday afternoon in honor of the late senator. Trump had ignored questions about McCain in the Oval Office Monday morning and at other events as well. 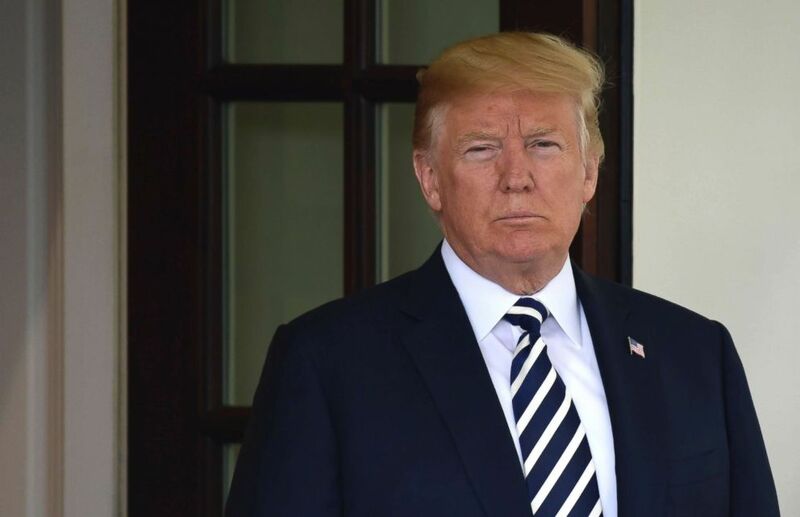 The president issued a statement Monday afternoon explaining why the flag was again lowered -- after facing widespread criticism for not keeping it at half-staff. 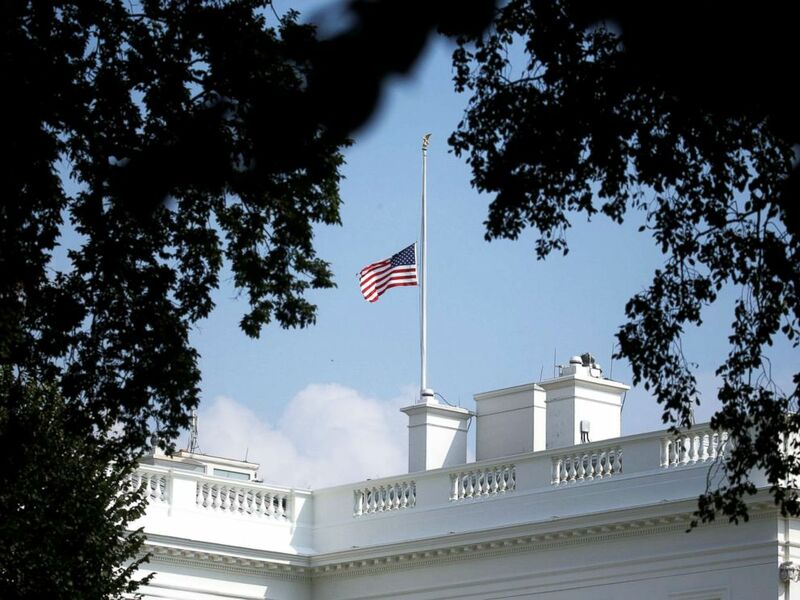 The White House flag is seen after being returned to half-staff in honor of Senator John McCain at the White House, Aug. 26, 2018. "Despite our differences on policy and politics, I respect Senator John McCain’s service to our country and, in his honor, have signed a proclamation to fly the flag of the United States at half-staff until the day of his interment," the president said. "I have asked Vice President Mike Pence to offer an address at the ceremony honoring Senator McCain at the United States Capitol this Friday," the statement continued. "At the request of the McCain family, I have also authorized military transportation of Senator McCain’s remains from Arizona to Washington, D.C., military pallbearers and band support, and a horse and caisson transport during the service at the United States Naval Academy. Finally, I have asked General John Kelly, Secretary James Mattis, and Ambassador John Bolton to represent my Administration at his services," the president said. But throughout much of the day, Trump had ignored almost a dozen questions from ABC News chief White House correspondent Jonathan Karl and reporters on McCain. In contrast, the president's daughter Ivanka Trump praised McCain as a "hero" at a women's empowerment event in Washington, D.C.
“As we gather here today I want to extend my deepest sympathies to the family of Sen John McCain –an American patriot who served our country with distinction for more than six decades," said Trump. "The nation is united in its grief and the world mourns the loss of a true hero and a great statesman." Camera shot facing south over the White House - you can see the flag at the WH at full staff while the flags surrounding the Washington Monument are lowered as of 5:13 am on Aug, 27, 2018. 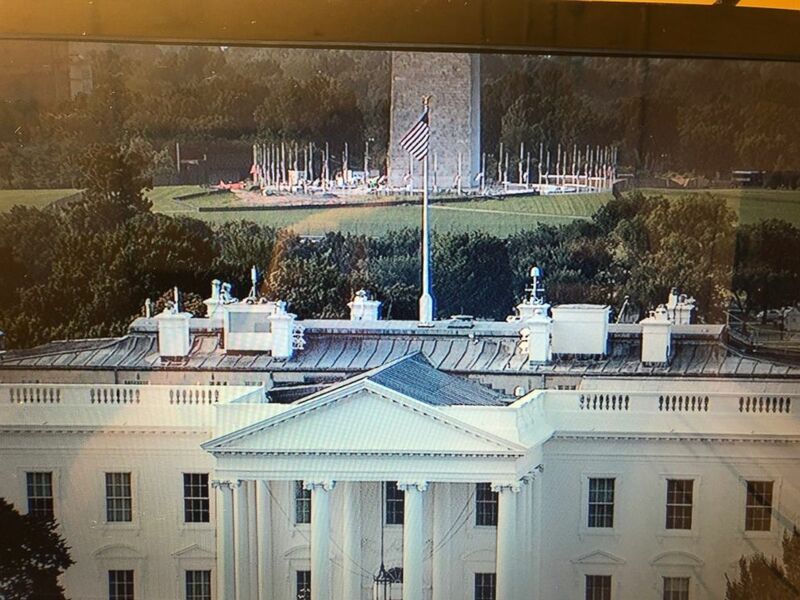 The initial White House flag-lowering that lasted less than 48 hours broke with precedent that it remain lowered until burial. President Donald Trump waits for the arrival of Italian Prime Minister Giuseppe Conte to the West Wing of the White House in Washington, July 30, 2018. Meanwhile, Trump inititialy rejected his aides’ recommendation to issue a statement praising the late Arizona senator, The Washington Post reported Sunday.